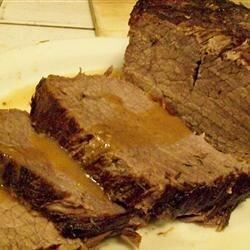 "A pot roast that can't be beat! A blend of flavors you never would expect. This has become a favorite of my historical interpreter friends. Wine can be substituted for water in the roasting pan if you like." Tying the roast, and cooking at high heat, ensure even roasting. It was good...not as tender as I had hoped. I would only do it for 2 hours next time. Easy and very tender. I had a smaller roast on hand and I think next time I will cut the cooking time down because mine was a little dry. The meat turned out really moist and tender. The gravy was excellent, I served it on sunday and the whole family loved it! I'll definitely try this one again. I wasn't crazy about the taste, but I'm not a big fan of roast beef anyway. My boyfriend loved it, and it was not too dry or anything. I'll probably keep this recipe around if I make roast again! My family loves this recipe. I am a vegetarian, but still have to make it for all of them. Hubby reverts to meat eater when it is made.